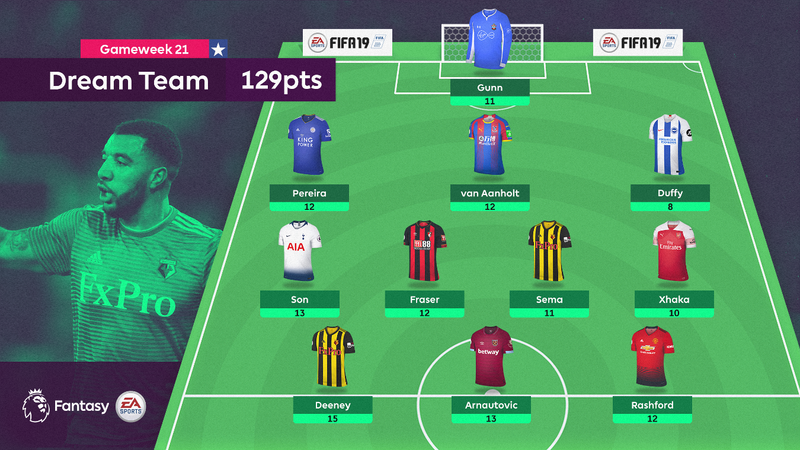 Watford's Troy Deeney (£5.8m) was the top-scoring player to earn a place in Gameweek 21's Dream Team in Fantasy Premier League. He was involved in all three of Watford's goals in their draw with AFC Bournemouth, scoring twice and providing an assist to return 15 points, his second double-digit haul of the campaign. Team-mate Ken Sema (£4.6m) and Cherries star Ryan Fraser (£6.1m) also scored heavily to make the XI. They line up in a 3-4-3 formation that produced 129 points from the final 10 matches of a busy Christmas schedule. Rare are the players who make a Premier League debut so memorable it earns them a Dream Team spot. The Southampton goalkeeper made six saves and earned the maximum bonus award to hold Chelsea to a goalless draw. Leicester City had an excellent Christmas, winning three of four fixtures. Pereira produced returns in all three victories, including an assist and a clean sheet in Gameweek 21's 1-0 triumph at Everton. An assist, clean sheet and the maximum bonus award helped the Crystal Palace defender to his third double-digit return of the campaign as the Eagles won 2-0 at Wolverhampton Wanderers. The only player to make it into the Dream Team with a single-digit score, Duffy earned his place with a goal and one bonus point from Brighton & Hove Albion's 2-2 draw at West Ham United. Son's recent form has been phenomenal. He's recorded returns in nine straight starts and his 13-point haul in Tottenham Hotspur's 3-0 win at Cardiff City made it four Dream Team appearances in the last six Gameweeks. The AFC Bournemouth winger had just one assist from five Gameweeks prior to Wednesday night's 3-3 thriller with Watford. Fraser made amends with a goal, an assist and two bonus points for his 21.8 per cent ownership. Another midfielder to catch the eye at Vitality Stadium was Watford's Sema. He scored his first Premier League goal and also provided an assist on his way to an 11-point haul. The midfielder has featured in all but one of Arsenal’s matches this season and produced his first double-figure haul, with a goal and maximum bonus, in a 4-1 win over Fulham. The star of the Gameweek, Deeney has fired three of his five goals for the season in the last four Gameweeks. The West Ham striker marked his second match back from a four-Gameweek injury layoff with both goals in the draw with Brighton. His ownership has dropped dramatically, down to 429,000 from a season-high 1.3million in Gameweek 15, but that may now change. Consecutive double-figure hauls for the Manchester United striker show his improvement under caretaker manager Ole Gunnar Solskjaer. Rashford has three goals and two assists from the Norwegian’s four Gameweeks in charge.